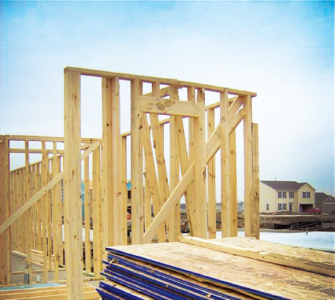 There's much that builders can do to build better homes while eliminating waste. But suppliers and trades have a part to play, too. and home building—went on. At least I am certain that anyone who attends my sessions in Edmonton is not there on a boondoggle, unlike events in Vegas, Orlando, or Los Angeles. The organizers had already lined me up for a couple of presentations to the home building audience on LeanBuilding topics. They then surprised me with another request. “Since you’re already here …” (I get this a lot), could I do a presentation or two directly targeted at the large contingent of suppliers and trade contractors participating in the conference? They had one title already, “How do you present a price increase to a builder?” I told them I could not do that one, but if they let me change just two words, I could not just do it but I’d present it with conviction. So I suggested the title, “How do you EARN a price increase FROM a builder?” Those two little words change everything. In my nearly 18 years writing monthly in the industry, I’ve been pretty tough on home builders. That’s right and fair because the ultimate responsibility for each house, each project, each community, rests on builders’ shoulders. There is so much more that builders can do to build better homes for their customers while eliminating the waste that eats up profits for builders, suppliers, and trades alike. Yet there’s also a great deal that can be done by suppliers and trades. During our LeanWeek events, 25 supplier/trade firms participate, and while most do an admirable job, to say that a lot is left on the table is a gross understatement. Yet, after having more than 4,000 supplier/ trade firms participate over the past eight years, it’s striking to compare the 5 to 10 percent that take it to the next level with the also-rans. The best suppliers and trades are pushing on builders to get into the 21st century, instead of the other way around. Examples abound, but let’s start with some of the negative cases to get our collective dander up. On a site visit in a Midwestern state with our preferred architect and engineer, we observed a significant pattern of waste concrete in the builder’s foundations, extending to basements and slabs alike. Haphazard footers were everywhere, some just dug into the dirt, most with excessive “boil-out” from under the forms (an easy problem to solve with care and a bit of landscape cloth) and nearly all wider than required by code. We found multiple thickened footers and piers oversized for requirements and some not needed at all. We saw oversized walls and stem-walls way beyond code and careless grading that resulted in excess concrete depths in slabs and/or excess gravel bases. In all, we estimated an average excess of a minimum six yards of concrete per house, overuse of rebar and gravel, plus the extra labor that goes along with excess material. It was easy to hang a very conservative number of $500 per unit savings for this builder for foundations alone. It seems our nature to want to know who to blame, yet upon further investigation, there were multiple fingers in the wastebasket. The initial design had unnecessary corners that could be eliminated without changing the look of the elevation. The poured wall could be better spec’d. The surveyors could have done a better job staking out the foundation. The foundation crew should have dug the footers more carefully, placed the form boards more accurately, and taken steps to eliminate the boil-out. All common stuff and all opportunities for improvement, but those are not what riled me. The poured-wall trade brought the preferred concrete supplier with him to his Lean session, saying that he was a sharp guy who knew everything about concrete, additives, and mixes. The trade was right. This guy was a walking Wikipedia of concrete knowledge and suggested several hundred bucks per house savings by spec’ing the mixes more appropriately. Then he dropped the bomb: “And hey … I’ve watched this for several years, and you guys always use five or six yards more concrete per unit than your competitors.” Most of the group seemed appreciative to learn this, as it was confirmation of what our team had told them. Meanwhile, I had to curb my compulsion to jump up and choke the guy! What??? He knew about this for two or three years and never said anything? He had made several references to builders not caring about anything other than cost per yard and how they’d switch suppliers for a buck. Well yeah, if the builder never sees any value-added from the supplier, what’s to stop him from switching? But if this supplier had showed the data to the builder and his trades, and had helped uncover this issue 500 units back, saving $250,000 in the process, might this have engendered some loyalty from the builder? Can I get a witness? Out West, I visited a move-up builder whose high-style homes were panelized. Their sole-source panel guys prided themselves on their precision building and delivering a high level of customer service. Yet what I saw was one of the worst wastes of wood—both dimension lumber and EWP—I have seen in my long career. The excess jacks, kings, and cripples festooned every wall, and the oversized headers bordered on the outrageous. The explanation? The panel guys were just building what the engineer specified. What could they do? The group of builder personnel seemed content with their response as if the panel company’s hands were tied. I was ready to explode. What could they do? A lot! Of course, I maintained my professional decorum and later, alone with the builder group, I explained how first they needed to reevaluate their relationship with their engineer. He was not just spec’ing a safe margin over code (read: too much material), he was demonstrating extreme neglect. This engineer in no way had his clients’ best interests at heart. He was directly responsible for several thousand dollars of waste per unit. I was at least as perturbed, however, with the panel plant. They agreed that these panels were substantially overbuilt, but had they ever walked through a house with the builder and pointed this out? The answer was no, as in “not my job.” This is a solesource partnership? Is this a good way to make money? 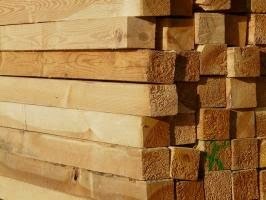 Not by providing the builder with a high-quality, well-built panel, but by doing that with 20 to 30 percent more wood than is needed? Some partnership! What happens when a competitive supplier comes along and gives this builder a lower bid? In this case, the panel guys earned the right—if not the probability—to lose the business. Shouldn’t the panel plant’s implied contract in a longterm relationship with this builder include looking out for him? Out East, a drywall company provided labor only, with the board purchased by the builder and supplied directly to the site. The labor contract was by square foot, delivered. At the site visit, the unusually large piles of drywall scrap stood out to an experienced eye. Our discussion revealed that during the last year several things had changed. First, there were two new plan series that sold well and now made up more than half of this builder’s business, but they were as inefficient as they were attractive. One secondary bedroom was 12'2" x 12'2" and a substantial hallway was 3'2" wide, all tailor-made for drywall waste. Add to those a lot of cut-up angles, nooks, and niches, and the piles grew. The second issue was that a new supplier got this builder’s business with a very aggressive price on 4' x 12' board. Before long, everything delivered to the site was 4' x 12', whereas previously efforts were made to size and stock the best size board for each part of the house. Finally, most of the business had been switched to a newer labor firm that didn’t complain about the new “4 x 12-for-all” approach. The new installers, paid by the foot delivered, were loving it. It was true that the builder’s overall material bill had dropped and the builder’s marginally experienced purchasing guy was touting the savings. But meanwhile, the labor bill had risen, eating up the lower board cost, and site-waste haulage was up. Yes, purchasing should have known better. 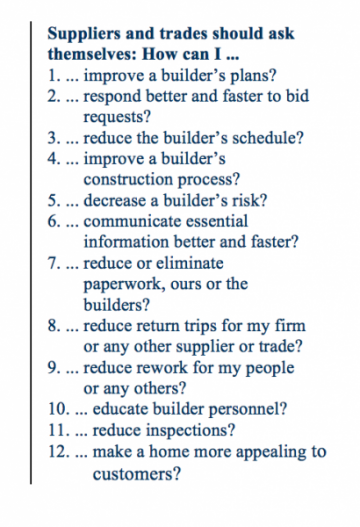 Yes, the supplier should concern himself with what is best for the builder. And most certainly, the labor contractor should have gone to the builder directly and told him that his goal was not to profit from poor material purchasing strategy. In this case, the simple answer, which came from the formerly No. 1 installer, was to turnkey the material and labor together and pay by the foot installed, not delivered. Within a month, the right sizes were stocked in each unit, labor costs came down, and waste costs dropped. Many builders will protest that their suppliers and trades just aren’t willing to be proactive. Meanwhile, suppliers and trades complain that the builders don’t care about anything more than initial bid price. If a trade does show initiative (they grumble), a builder quickly takes the idea and rebids it out to everyone. True, we have seen both of these situations, and for the “typical” builder, supplier, or trade, it’s not even unusual. 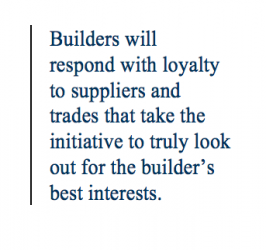 Yet the best builders will respond with loyalty to suppliers and trades that take the initiative to truly look out for the builder’s best interests. So if you are a supplier or trade, how do you reorient yourself this way? It starts with asking yourself the right questions. Here are some high-potential ones to consider that will force you out of the box. Each one has the potential to reduce a builder’s total cost, which lessens the importance of bid price. If you can devise strong answers to just a few of these, builders are guaranteed to take notice. Are the 12 questions listed here tough? Good! Hard to prove to your builders? Better! How can I say this? Simple! Because if it was easy, all of your competitors could answer these questions as well as you, and then what competitive advantage would you have? Who says you can't have your cake and eat it too?